Early one February morning, I stepped out my front door to share the last of my coffee with acid loving plants that continue to grow and bloom in South Carolina at this time of year. I stepped onto my front porch and nearly stumbled over a large stick left while I had been away. A smile immediately spread across my face for I knew exactly who had left this treasure – and why. It was a gift from Lucy's best friend. Have you ever been lucky enough to have a best friend? A real friend that loves you exactly as you are and for exactly who you are? Perhaps it’s a friend that came to you early in life. One you have shared years of experiences and memories with and still find yourselves inseparable. Perhaps your best friend came to you later in life. Maybe you were brought together by location or circumstance and your friendship is growing in strength with each shared experience and the passing of each year. Perhaps you have found a cherished connection with someone much older -or perhaps much younger- than you. Sometimes, friendships are found in unexpected places between the most unexpected companions. Whatever the circumstances, a best friend is a special gift to be treasured. And some things hold true in any friendship. There is complete acceptance of, tolerance for, and understanding of any differences between friends. There is respect for the choices made by our friends-even if they differ from the the choices we might have made. I have been fortunate to have good friends in my life that I can count on in any situation. Since you are reading this post – and have likely read my book Two Minus One: A Memoir – you already know of my longtime and very best friend, Robbie as well as my rescue dog, Lucy, who in fact came to my rescue during the most difficult of times. 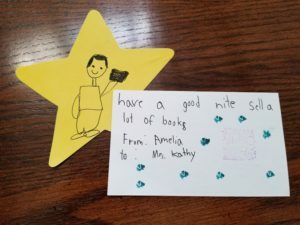 What you do not know is that I – and Lucy – have also forged a new and lasting friendship in Amelia who has come into our life simply to spread joy and goodness with her frequent visits to our home. I met Amelia and her family when they first moved into the neighborhood and she was only a year old. She is part of a delightful household, but with three small children – and the activities in which they are involved – it was just a casual acquaintance. However, with the arrival of Lucy, and Amelia’s growing mobility and friendliness, she became a regular visitor in my home. She adored Lucy, and Lucy adored her! 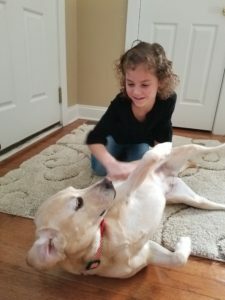 Initially, Amelia’s visits routinely resulted in scratched cheeks and arms as Lucy in her excitement would immediately jump on her new-found friend! Amelia never cried, but always offered support and understanding stating, “She is just excited to see me!” which indeed, she was! As both grew older and even more in control of their interactions, the visits grew increasingly frequent and lengthy. Amelia would ring the bell, enter and slide down to her bottom and take control. In the calmest and most grown up of voices, she would command, “Lucy, settle down and get your bone.” Not surprisingly, Lucy did just that. Bringing her bone back to lie beside her friend, she would chew happily – which always calms her. Amelia lovingly cooed and rubbed her belly telling her, “You are such a good girl, Lucy!” Observing the two of them – and enjoying the conversation initiated and the insights provided by Amelia – I marveled at the depth of the friendship that was developing between the three of us and just how much I was enjoying my observations of the two of them together. Visits continue, conversations have become lengthier and more in depth, and surprises are always in store. A favorite treat will appear for Lucy. There are sometimes baked goods Amelia has helped prepare for me. We think that Amelia was behind the stash of dog treats the year Lucy was “BOO’d” on Halloween. Understanding just what Lucy likes, Amelia had carefully selected chew toys and peanut butter treats for her special friend. Often, like today’s stick, surprises are placed on the front porch to await our return. Knowing a stick was Lucy’s favorite non-edible treat, Amelia delivered it to our door for her best friend! So, you see, friendships can be found everywhere! Young and old, animal and human, newly discovered or polished with age, acceptance, tolerance, and understanding are treasures we can all share and embrace. I, for one, would like to see much more of it. How about you?